Common Sense Media has just announced that it’s Digital Citizenship textbooks are currently free via iBooks until September 30, 2016. After September 30th, the iBooks will go to $8.99 per device for the teacher edition and $1.99 per device for the student workbooks. You can download the books via the iTunes store here. This entry was posted in Apple, Education, Educational Resources, Educational Technology, Lesson Plan, Professional Development, Social Media, Teachers, Technology and tagged common sense media, Curriculum, Digital Citizenship, digital literacy, Ed Tech, Education, Education Technology, Educational Resources, Educational Technology, Free Educational Resources, ibook, textbook on September 6, 2016 by Jennifer Carey. The topics they tackle are online engagement, cyberbullying, teen romantic relationships, their relationship with parents, and more. Most of the information should come as a relief to parents and educators. For example, in spite of hyped cyber-bullying reports in the news, 69% of teens believe that people are “mostly kind” when they engage online. Also, when it comes to Romance, teens still prefer to engage with those they know in real life; retaining a healthy skepticism towards individuals they meet online. Social Media, however, does seem to be a forum for flirtatious exchanges. And breaking up? Doing it in person is still the most socially acceptable method. You can read the comprehensive report and data at PEW Research: Teens & Technology. This entry was posted in Education, Educational Technology, Social Media, Technology and tagged Digital Citizenship, digital literacy, Education, Education Technology, Educational Technology, Social Media on October 5, 2015 by Jennifer Carey. If you do not have a SXSWedu account, you can create one here. With ubiquitous classroom technology, students’ privacy is an increasing concern. Federal laws, such as the Children’s Online Privacy Protection Act and the Family Educational Rights and Privacy Act, are difficult to navigate but vital to protecting students’ rights. This panel will focus on demystifying the process, providing key strategies for lawfully implementing technology, and looking to the future of technology and education. Panelists include technology and school administrative leaders (at both public and private schools) as well as a software developer for PK-elementary tools. Gain an understanding of current Federal Privacy Laws that apply to schools. Understand how to vet and implement technology tools in schools. 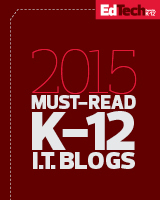 Understand the direction that privacy and educational technology will take in the future. This entry was posted in COPPA, Education, Educational Resources, Educational Technology, FERPA and tagged Digital Citizenship, digital literacy, Education, Education Technology on August 10, 2015 by Jennifer Carey.